With almost 1,100 aircraft built the DH-82A Tiger Moth represents the largest production run of any aircraft built in Australia. de Havilland’s Mascot factory produced the aircraft between 1940 and 1945 with General Motor’s Holden manufacturing the engine at their Fisherman’s Bend plant. 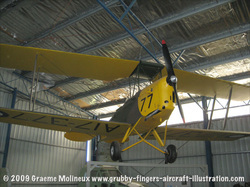 The Tiger Moth was the basic flying training aircraft of the RAAF during and after WWII and, as such, was involved in the world-wide Empire Air Training Scheme through which many thousand young men had their first experience of flight in locations as diverse as Kenya, Canada, South Africa or Australia. Post-war the aircraft went on to become the mainstay of many flying clubs and is now a highly prized veteran aircraft. The museum’s Tiger saw service with the RAAF at several east coast training establishments and post-war was used by TAA for the instruction of apprentices in airframe maintenance. It was donated to the museum in 1985 and has undergone an extensive restoration over a period of eight years.